Was Melania Trump's outfit plagiarized by Ohio congresswoman? Ohio Congresswoman Joyce Beatty took to the Democratic National Convention stage with an eerily familiar look. 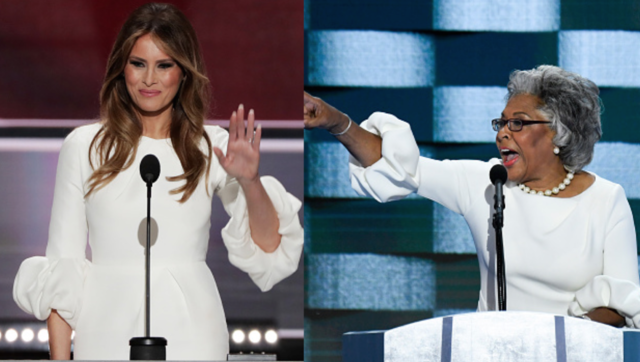 Beatty, who represents the Ohio capital of Columbus in the United States house, took to the stage in a white, long-sleeved dress, similar in appearance to what Donald Trump's wife Melania wore on Night one of the Republican National Convention. Like Trump's dress, Beatty's white dress had bunched-up sleeves above the wrist. Both dresses extended to their knees, and they both accessorized with brown high heels. Unlike Trump, Beatty sported a pearl necklace. Trump's speech was infamous as her speech writer admitted that some passages were lifted was a portion of an address given by Michelle Obama at the 2008 Democratic National Convention. On Thursday, Donald Trump Jr. claimed that part of President Barack Obama's speech from Wednesday at the DNC was stolen from an excerpt of Donald Trump's speech at the RNC last week.